In a large nonstick skillet, heat 1 tablespoon of oil over medium-high heat. Season steaks with remaining 1/4 teaspoon each salt and pepper. 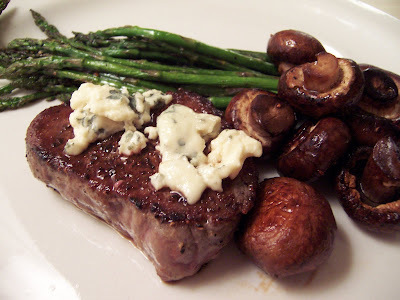 Cook for 3 minutes, turn and top each steak with 1 tablespoon of cheese. Reduce heat to medium and cover. Cook for 2 minutes or until internal temperature of steak is 145 degrees. Set on plate and loosely cover. Add remaining 2 teaspoons oil and mushrooms to skillet; cook over medium-high heat for 3 minutes. Stir in remaining cup of broth and vinegar; cook 3 minutes, stirring occasionally. Serve with garlic mashed potatoes or country potatoes, and roasted asparagus.